Info about "African wrestling (lutte traditionnelle) video"
Senegalese wrestling is a type of folk wrestling traditional to Senegal and parts of The Gambia, and is part of a larger West African form of traditional wrestling (fr. Lutte Traditionnelle). The Senegalese form traditionally allows blows with the hands (frappe), the only of the West African traditions to do so. 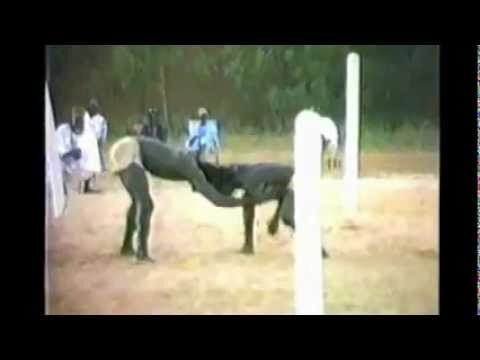 As a larger confederation and championship around Lutte Traditionnelle has developed since the 1990s, Senegalese fighters now practice both forms, called officially Lutte Traditionnelle sans frappe (for the international version) and Lutte Traditionnelle avec frappe for the striking version. Transcending ethnic groups, the sport enjoys the status of national sport. Traditionally, young men used to fight as a distraction, to court wives, prove their manliness, and bring honor to their villages. Usually each wrestler called M’burr in Wolof performed a particular dance before the start of the combat. Today it is very popular in the country as an indication of male athletic strength and ability . Presently, wrestling is arranged by business-promoters who offer prizes for the winners.